You can also text or call my cell 24 hrs at 541-331-3421. Please be sure to leave a message if I do not answer. Integrating your RadioRA®2 system with a security system via Alarm.com will net you conditional programming previously unavailable and only reserved for Lutron's Flagship Homeworks QS line. Yes - this is super exciting news & this integration was just released October 30th, 2013. Scroll down for more details. Again Thank you for considering my help with your Lutron ★ Project - I know you have a choice of where & who to buy from so I want you to know that I do appreciate your business more than you will ever know! Lutron & Alarm.com have been touting this new alliance since April 2013. I have been anxiously (and most definitely not patiently) awaiting this integration. But what I didn't know at that point in time was how fabulous that integration truly was. I can now offer all my RadioRA®2 clients a level of conditional programming previously unavailable to my software programmed RadioRA®2 systems and that which Lutron only reserved for its flagship Homeworks® QS line. I know a lot of my clients were wanting more conditional control beyond timeclocks – (meaning your lights would behave differently at different times of the day) which I could only do with multiple occupancy sensors in a room until now. 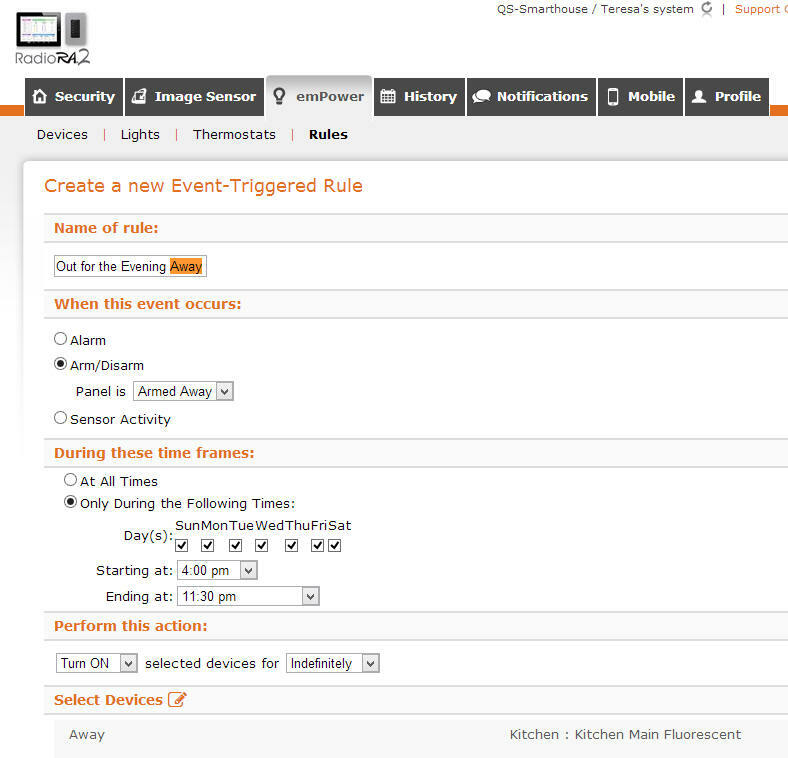 Through alarm.com event triggered rules - that all has changed. I can not believe how much nicer my Home Control System is now that this is up and running and paired with my alarm system… When I push arm during the day – the alarm.com system sends a signal to my Lutron Repeater and turns off all my lights. Or if I leave for the evening – when I arm the system – it runs my evening away scene. When I come home and disarm or arm/stay – depending on the time again – it will either run my Welcome Home Scene or if it is on the nights I typically entertain – it will automatically run my Entertain scene. This takes scene control to a whole new level of convenience. Plus through the alarm.com pc interface you can now turn your lights on and off from your computer as well. 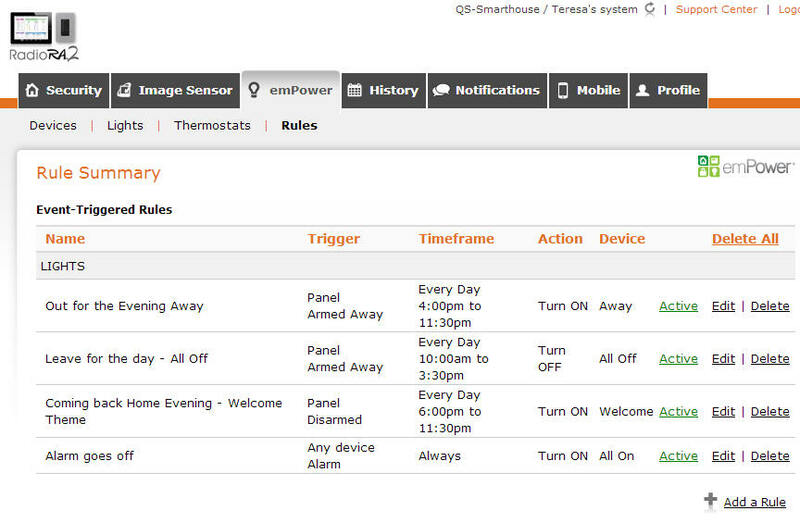 Another previously unavailable option thru Lutron …You can also arm/disarm your system, get up geo-fences, notification, auto arm/disarm schedules, integrate auto door locks, and so much more. Features include touchscreen display, talking two way touchscreens for easy door control, auto alarm schedules, arm/disarm from your smartphone, tablet or computer as well as motion activated image capture sensors that allow you to peek in during the day to check on pets, kids, plus images are taken during all alarm events. You can even peek in on contractors working on your home plus add Schlage auto door locks and you can open the door for them too! Plus you can even set this up to turn on all your lights when an alarm is triggered (recommend keeping bedroom lights off though so one can hide)! And so much more including even weather reports to your panel! Smile - Can you tell I am excited? I run this system in my own home and I am just delighted with this new level of conditional programming unavailable before with RadioRA®2 on its own. Anyhow – thought you might like to know about some of the cool new innovations that keep making your RadioRa®2 system even better. or If you want the full details - Here is my excel form: www.t-crealty.com/Lutron/Lutron/RA2 Lighting Design Form.xlsx if you know your total number of fixtures, type of bulbs (LED, CFL, Halogens, Incandescent, etc) and proposed wattage on each circuit so I know for sure you are purchasing the correct dimmers, keypads, etc for your proposed circuits. Fabulous TIP If you are in the process of building a home or addition - I can email you a photo of a fantastic option for you if your walls and electric are not in yet. I have quite a few clients that now wiring all of their lighting circuits into a closet and then putting the keypads in the rooms instead of 4 or 5 gang banks of light switches. Usually if I can get a hold of the process soon enough - I can cure your home of Wall acne forever and I strongly recommend you consider this option. RA2 works perfectly & every time so you can install large button back lit keypads in your rooms engraved with what ever options you decide the buttons are to perform for you (you have up to 7 button keypads to take advantage of). Absolutely a Fabulous option and looks gorgeous in both new homes & retrofits. This also works well if you have a basement or good crawl space. Install your dimmers down there and turn your wall boxes into keypad boxes or just install Hybrids. I guarantee you'll be thrilled with the results & convenience. The Honeycomb Shades are now called the Sivoia QS Triathlon Shades and that now includes the highly demanded battery operated Roller Shade. You can view more about this new line by clicking here. For either option - I will need to know your budget and your time frame for the shade install project, whether you want to go DIY or hire an installer. Again Thank you for considering my help with your Lutron ★Project - I know you have a choice of where & who to buy from so I want you to know that I do appreciate your business more than you will ever know! If you have any questions or concerns, please feel free to contact me by email at teresa at t-crealty.com or you can call or text 24 Hours to 541-331-3421 (even orders and I can have a PayPal request to you usually within 1 hour or less). Thank you!